The Aleethia Foundation / An evening with caring friends! An evening with caring friends! 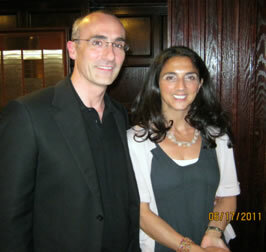 Arthur and Ester Brooks hosted “Aleethia’s Friday Night Dinner” on June 17, 2011 which was held at the National Press Club. AEI staff members Jessica, Mallory, Lindsay and Kassondra were our "special volunteers" for the evening. Everyone enjoyed a relaxing and friendly Friday night with caring friends and family members. We wish to thank Ester and Arthur for a wonderful evening! THE ALEETHIA FOUNDATION is proud to announce that Aleethia is “Day 38 WINNER” in “Toyota’s 100 Cars for Good Program” and because of your vote and spreading the word to vote on Wednesday, June 15, 2011…The Aleethia Foundation won a Toyota Sienna Wheelchair Accessible Van! !” HOOAH!! !